The Up-Flo™ Filter is an innovative surface water filtration technology that delivers a high-performance multi-stage treatment process within a single device. The Up-Flo™ Filter combines sedimentation screening with fluidised bed filtration technology to deliver high levels of performance. Easy to maintain and with low construction costs, the Up-Flo™ Filter achieves a high quality of surface water discharge in a much smaller footprint then alternative systems. The unique Hydro Up-Flo™ Filter combines multiple, sequential treatment processes to deliver sedimentation, screening and filtration all in one compact unit. The Up-Flo™ Filter removes litter, sediments, nutrients, metals and hydrocarbons. Specific pollutants can be targeted through a wide choice of media options. During extreme rainfall events, a high-flow bypass system is activated preventing the drainage network from being overloaded. 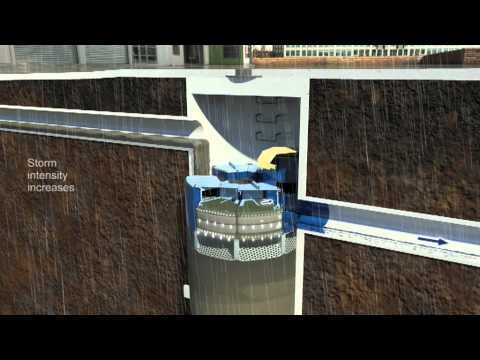 All storm flows up to and including the bypass flow are retained within the device, so there is no surface ponding. Retaining pollutants within the drainage system also avoids excessive build-up of contamination and toxicity issues that could otherwise accumulate in plants and animals (bioaccumulation). The Up-Flo™ Filter is supplied fully assembled in a precast concrete manhole for easy installation. Its advanced filter units can also be simply retrofitted into an existing chamber on-site. The gentle and effective action of the Up-Flo™ Filter ensures filtration media have a much longer life than comparable systems, so maintenance is infrequent, cost-effective and simple. The filter media packs can be exchanged manually without the need for specialist equipment. To find out more about Up-Flo Filters, please call our Sales Team or fill out the enquiry form and we’ll get back to you within 24 hours.